Well it's time to purge a bit and the first thing to go is the 1989 Turbo II. It has 59,750 miles, Blaze Red and black leather interior. The compression is in the 9s on both rotors. All maintenance has been completed, New tires, touchscreen double din with all new speakers, paint is in remarkable condition and has been detailed. The front end was repainted due to the rare front lip being scraped up. Also at some point the passenger front quarter panel was also repainted due to being scratched. The car has never been in an accident and has a clean carfax. I am the second owner. All paperwork of recent maintenance including compression test is available. Tires, brake pads, NGK wires and plugs are new. The car runs and drives without issue and is turn key and ready to drive. Antenna and a couple of wiper speeds don't work. Since the audio is Bluetooth and flash drive usable no need for the Antenna. I only drove it on nice days no need for wipers. A slight dent under the rear driver side back quarter which is hardly visible. The car is in excellent condition in every way and ready for a new home. 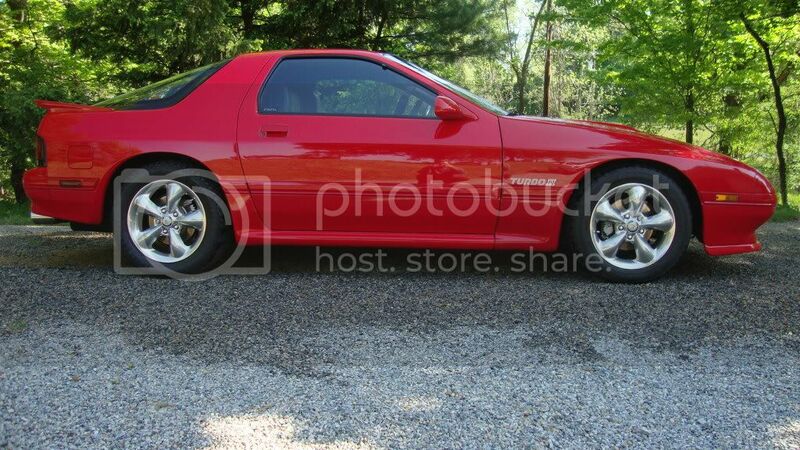 Asking $14,500 which is in line with both NADA and Hagerty. Nice car. I don't see much action over here, but if asking that price, I'd fix the wiper switch, replace antennae cable, and install battery box top and have it like new with no problems. Those replacement side skirts/fender extensions leave a lot to be desired as rarely do they match in color. Shame it wasn't repainted when they had the body panel(s) painted. The wiper switch and antenna where in the pricing. I can get those fixed whenever since they are not used at all. As for the rocker panels, I wanted them to be original but have been thinking of getting them repainted to better match the other panels. All in all these are not true issues, but I hear what you're saying. In person the panels don't look as they do in the pics, shading has a lot to do with the colors. I have had offers over 13k but the values on this is higher than that. No rush to sell, nice to have a choice of which rx7 to drive. Another consideration is that now the repaint will be base/clear while the OE is single stage. We purchased our car new and wouldn't have had it repainted, but the wife was hit in the driver side door when stopped and a minor accident became a living nightmare and that's putting it mildy. At this time I would rather have them a shade off and keep it stock. The more it gets tweak to perfection the more the price will increase. Can't be stock as it was repainted before and the body extension(s) have been replaced. The body extensions have not been replaced and the repaint was the nose and a quarter panel only. Rest of car is original. I still say the passenger side fender extension was replaced. Have seen many replacement fender extensions and they were darker than the body. In fact I had one replaced on my car as I turned into an extended curb and damaged the R/S extension. Got the car back from the shop and the extension was a shade darker. Had I known, I would have had the shop paint the extension. Actually, have never seen an extension/skirt from the factory with a shade difference. Look closely and you can see the fender extension is darker than the door. Actually, you'll see that the fender is also slightly darker, but that occurred when the car was 3 months old and some nut backed into the headlight door and nicked the tip of the fender while the car was parked. Top of the fender was repainted but extension wasn't touched. Extension was replaced in 1995 when I struck the curb. When the car was repainted last year, I had everything painted at one time to avoid any shade difference, including the 2 extra sets of side skirts , 2 extra sets fender extensions, 3 extra front spoilers, and a headlight door air intake. Guess it really doesn't matter one way or the other as it's so insignificant. Once again, good luck with the sale. Last edited by Turbonut; 10-08-2016 at 07:05 AM.. I see the shade difference on yours. When the front was taken off I asked to have them check if any parts were replaced or an accident occurred, no structural damage. I also had Mazda check to see if any parts were ever ordered for the car, none were. So it was definitely a repair that was due to a minor thing. You're right the only way to not have it slightly different is a complete repaint which would ruin the 98% of it that is original. The plastic parts are not an issue. In most lighting it's hardly noticeable.